My attempt at a split to make another hive appears to "bee" succesfull! I kept the nuc hive in the basement for a full week which was a little longer than I should have but it seems to have worked. As soon as I opened up the base, they came out in a furry, many of them made off for a good bathroom flight while some just checked the outer part of the hive out. 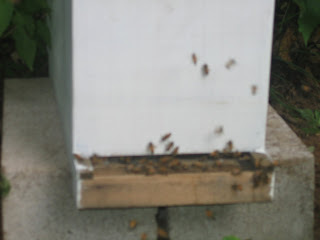 I did not take a chance to open it up quite yet, a hive tends to be a bit aggressive while they are raising a new queen and with a 90 degree day I am not about to put the bee suit on. I will give this some time and see how well it has worked out in a couple of days.